There are 5 million---that’s 5 MILLION—Californians who have jobs that pay only minimum wage. As attendees listened to a California Legislature hearing held at Norco College last Friday, another striking fact really jumped out: A sizeable number of those jobs are held by people who are the main wage earner in their households. “We have plenty of minimum wage jobs. What we need are more living wage jobs,” Assembly Member Sabrina Cervantes (D-Corona) told the Assembly Select Committee on Career Technical Education and Building a 21st Century Workforce audience of over 100 persons—another indication that identifying the nexus between education, career readiness and workforce development is a top issue in California. Cervantes, whose district includes Norco College, joined Select Committee Chair Autumn Burke (D-Marin Del Rey) in listening to a group of panelists from Riverside County and across California on what to do. 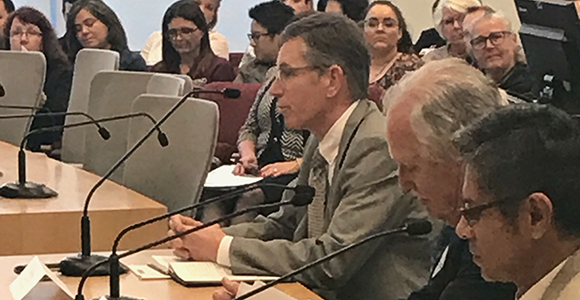 CA Fwd President and CEO Jim Mayer—whose organization leads the California Economic Summit—called for statewide metric and targets to reduce income inequality and poverty to be defined and embedded in state law. Mayer emphasized that California needs nearly one million middle-income jobs—and the workers to fill them—and also noted that housing prices are rising faster than wages, which is a trend that must be reversed if the middle class is going to grow in the years to come. Kaye also touted the importance of Linked Learning to create a long-term pipeline of students that are trained for the jobs of the 21st century. The Linked Learning approach integrates rigorous academics that meet college-ready standards with sequenced, high-quality career-technical education, work-based learning, and supports to help students stay on track. Jamil Dada, an employer in Riverside County who also chairs the county’s Workforce Investment Board said employers are calling job centers in Riverside County and “we can’t provide them middle skills candidates." “We need to do a much better job connecting schools and businesses,” he added. For Norco College President Dr. Bryan Reece, whose school has over $3.4 million dedicated to California Community Colleges Strong Workforce programs, it is the importance of apprenticeship programs that he urged Assembly members to remember. “They are very effective in preparing the workforce,” he said. For Assemblymember Burke, this hearing represented the first of several that will be held across California designed to shine light on our workforce issue and identify effective solutions to meeting the challenges outlined Friday. She also promoted AB 1743, which she has introduced, which will continue funding Career Technical Education grants in California. For Assemblymember Cervantes it was a chance to bring light to her home district and the Inland Empire where the unemployment rate is only 3.7 percent, but still—like much of California--suffers from a lack of the medium wage jobs that are the underpinning of the middle class. For all of California, it is a policy imperative, as noted recently by Joe Sanberg, a progressive entrepreneur who is working through both the public and private sectors to make people's lives better and is a member CA Fwd’s Leadership Council. Building a new path for every California community to become more resilient to the disruption caused by natural disasters, climate change, and the economic uncertainty of the 21st century economy. The 2018 California Economic Summit will be held in Santa Rosa on November 15-16. More info can be found on the 2018 Summit event page.